Beit Hanina Village: Under-construction Building Belonging to Hussein 'Alqam was Demolished by Israeli Forces Under the Pretext it was not Licensed. 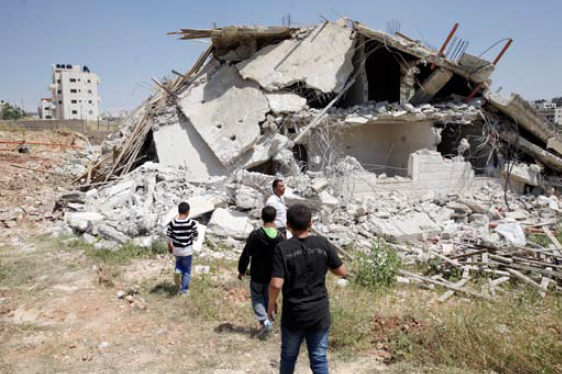 Israeli forces have continued with systematic attacks against Palestinian civilians and their property in the occupied Palestinian territories (oPt) for the reporting period of 07 – 13 May 2015. During the reporting period, Israeli forces wounded 18 Palestinian civilians, including 4 children and 3 photojournalists, in the West Bank and Gaza Strip. Eleven civilians were wounded in the West Bank, 9 of whom, including 2 children and 3 photojournalists, were wounded during peaceful protests, while the other 7 ones, including a child and 4 fishermen, were wounded in the Gaza Strip. In the West Bank, a 22-year-old civilian sustained serious wounds to the chest and right thigh on 07 May 2015, when he was shot by Israeli forces during an Israeli incursion in al-Fare'ah refugee camp, southeast of Tubas. On 11 May 2015, a 16-year-old child sustained a bullet wound to the left knee as Israeli forces fired at him during an Israeli incursion in Sateh Marhaba area, east of al-Bireh city. Israeli forces continued the use of excessive and systematic force against peaceful protests organized by Palestinian civilians and Israeli and international solidarity activists against the construction of the annexation wall and settlement activities in the West Bank. As a result, 9 protestors, including 2 children and 3 photojournalists, were wounded, while others suffered tear gas inhalation during peaceful protests. In the Gaza Strip, on 08 May 2015, a 17-year-old child sustained a serious wound to the head as Israeli forces stationed along the border fence, northwest of al-Sayafa area in the north of the Gaza Strip, opened fire at a group of youngsters who were present near the said fence. On 09 May 2015, 2 farmers sustained shrapnel wounds when Israeli forces stationed along the border fence opened fire at some farmers and workers who were 300-500 meters away from the said fence in the north of the Gaza Strip. In the context of targeting fishermen, Israeli forces opened fire several times at fishermen. As a result, 4 fishermen were wounded, 2 others were arrested and fishing equipment and nets were damaged. These attacks coincided with the sardine season that starts in May until mid-June. Fishermen wait for this season to compensate their losses due to Israeli attacks against them. During the reporting period, Israeli forces conducted at least 58 military incursions into Palestinian communities in the West Bank. During these incursions, Israeli forces arrested at least 20 Palestinians, including 5 children. They also arrested a civilian in the Gaza Strip. This resulted in grave violations of the economic, social and cultural rights and a deterioration of living conditions for 1.8 million people. The Israeli authorities have established Karm Abu Salem (Kerem Shaloum) as the sole crossing for imports and exports in order to exercise its control over the Gaza Strip’s economy. They also aim at imposing a complete ban on the Gaza Strip’s exports. In many occasions lately, Israeli forces arrested Palestinian patients and their companions and traders. On 07 May 2015, Israeli forces damaged about 30 electricity poles on the road leading to Om al-Sedrah and al-Masamrah areas, south of al-Ramadeen village, southwest of Hebron. As a result, the 2 areas had power outage. On 08 May 2015, 3 settlers from "Sousya" settlement, south of Yatta, south of Hebron, cut off branches of 3 old olive trees belonging to Mohammed al-Nawaj'ah in Kherbet Sousya. On 09 May 2015, a group of settlers attacked a number of houses belonging to Palestinian civilians in Tal al-Rumaida neighborhood in the center of Hebron, and denied them access to their houses. They also threw stones at a house, tried to raid it and attacked children in that house in front of Israeli soldiers deploying in the area. On 10 May 2015, Israeli forces demolished Shaikh Kamel tomb in Beit dajan village, east of Nablus. They seized all stones of the tomb. During the reporting period, Israeli soldiers used excessive force against peaceful demonstrations organized by Palestinian civilians, international and Israeli human rights defenders in protest at the construction of the annexation wall and settlement activities in the West Bank. As a result, a number of protestors suffered tear gas inhalation and others sustained bruises as they were beaten up by Israeli soldiers. In the same context, 9 civilians, including 2 children and 3 photojournalists, were wounded during peaceful protests in Kufor Qaddoum village, northeast of Qalqilya; and the southern entrance of al-Jalazoun refugee camp, while others suffered tear gas inhalation during Selwad and Ofer protests, southwest of Ramallah. Following the Friday prayer, on 08 May 2015, dozens of Palestinian civilians and international and Israeli human rights defenders organized a peaceful demonstration in Bil’in, west of Ramallah, in protest at the construction of the annexation wall and settlement activities. The protestors marched by the annexation wall and tried to cross the fence. Israeli soldiers stationed behind the wall, in the western area, and a large number of soldiers deployed along it, fired live bullets, tear gas canisters, rubber-coated metal bullets, sound bombs and wastewater at them and chased them into the olive fields. As a result, a number of protestors suffered tear gas inhalation. Around the same time, dozens of Palestinian civilians organised a peaceful demonstration in the centre of Ni’lin village, west of Ramallah, in protest at the construction of the annexation wall and settlement activities. The demonstrators took the streets and headed to the annexation wall. Israeli forces closed the gates of the wall with barbwires and prevented the demonstrators from crossing to the land behind it before they responded by throwing stones. Israeli soldiers fired live ammunition, rubber-coated metal bullets, sound bombs and tear gas canisters at the civilians, and chased them into the village. As a result, a number of protestors suffered tear gas inhalation and others sustained bruises as they were beaten up by Israeli soldiers. Also following the Friday prayer, dozens of Palestinian civilians and Israeli and international human rights defenders gathered in the center of al-Nabi Saleh village, northwest of Ramallah, to start the weekly peaceful protest against the construction of the annexation wall and settlement activities. They made their way towards Palestinian lands that Israeli settlers from the nearby "Halmish" settlement are trying to seize. Israeli soldiers closed all the village's entrances to prevent the Palestinian and international solidarity activists and journalists from participating in the protest. As a result, a number of protestors suffered tear gas inhalation and others sustained bruises as they beaten up by Israeli soldiers. Following the Friday prayer, on 08 May 2015, dozens of Palestinian civilians organized a protest at the eastern entrance of Kufor Qaddoum village, northeast of Qalqilya, heading to the eastern entrance of the village in protest against closing that entrance since the beginning of al-Aqsa Intifada with an iron gate. 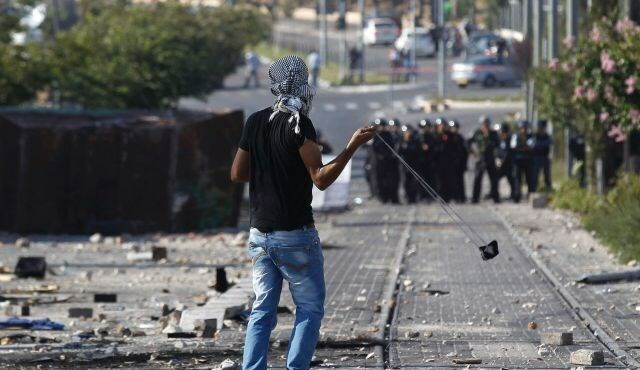 The demonstrators threw stones at Israeli soldiers, who fired sound bombs and tear gas canisters in response. As a result, 5 civilians, including 2 children and 3 photojournalists, sustained bullet wounds and were hit by gas canisters. The 2 children, (14) and (10), sustained bullet wounds to the left legs. The 3 photojournalists working in PalMedia, Palestine TV and Wafa News Agency were hit by tear gas canisters in their upper parts. Their wounds were moderate. Also following the Friday prayer, dozens of Palestinians gathered at the western entrance of the Silwad village, northeast of Ramallah, on the road between Silwad and Yabroud villages, near Bypass road (60), in protest at the Israeli policies. The protestors set fire to tires and threw stones and Molotov Cocktails at the aforementioned road and Israeli soldiers. In response, Israeli soldiers stationed in the area fired live ammunition, rubber-coated bullets, sound bombs and tear gas canisters at the protestors. As a result, a number of protestors suffered tear gas inhalation and others sustained bruises as they were beaten up by Israeli soldiers. On Friday afternoon, dozens of youngsters gathered from different areas of Ramallah and al-Bireh in the vicinity of Ofer detention facility, southwest of Ramallah, in protest at Israeli attacks on Palestinian civilians and to mark the Palestinian Prisoners Day. They headed towards the facility’s gate that was closed by Israeli soldiers. They set fire to tires and threw stones and empty bottles at the soldiers. Israeli forces deployed around the detention facility and started firing live and rubber-coated metal bullets, sound bombs and tear gas canisters. As a result, a number of protestors suffered tear gas inhalation and others sustained bruises as they were beaten up by Israeli soldiers. Also following the Friday prayer, dozens of children and young men gathered at the southern entrance of al-Jalazoun refugee camp, north of Ramallah. They were about 300 meters away from the fence of "Beit Eil" settlement. Israeli forces stationed in the area fired live ammunition, rubber-coated metal bullets, sound bombs and tear gas canisters. As a result, 4 civilians, including 2 children, were wounded. They were taken to Palestine Medical Compound in Ramallah. Moreover, a number of protestors suffered tear gas inhalation and others sustained bruises as they were beaten up by Israeli soldiers. A 16-year-old child sustained a bullet wound to the chest, a 17-year-old child sustained a bullet wound to the left ear, an 18-year-old civilian sustained a bullet wound to the right ear and a 22-year-old civilian sustained a bullet wound to the right side of the neck. The total closure of al-Mentar ("Karni") crossing since 02 March 2011 has seriously affected the economy of the Gaza Strip. Following this closure, all economic and commercial establishments in the Gaza Commercial Zone were shut off. It should be noted that al-Mentar crossing is the biggest crossing in the Gaza Strip, in terms of its capacity to absorb the flow of imports and exports. The decision to close al-Mentar crossing was the culmination of a series of decisions resulting in the complete closure of the Sofa crossing, east of the Gaza Strip in the beginning of 2009, and the Nahal Oz crossing, east of Gaza City, which were dedicated for the delivery of fuel and cooking gas to the Gaza Strip, in the beginning of 2010. Israeli forces have continued to impose a total ban on the delivery of raw materials to the Gaza Strip, except for very limited items and quantities. The limited quantities of raw materials allowed into Gaza do not meet the minimal needs of the civilian population of the Gaza Strip. For almost 8 consecutive years, Israeli forces have continued to prevent the delivery of construction materials to the Gaza Strip. Two years ago, Israeli forces approved the delivery of limited quantities of construction materials for a number of international organizations in the Gaza Strip. On 17 September 2013, they allowed the entry of limited quantities of construction materials for the private sector. However, on 13 October 2013, they re-banned it claiming that these materials are used for constructing tunnels. Israeli forces allowed the entry of construction materials only for UNRWA and UNDP projects. As a result, construction works have completely stopped impacting all sectors related to construction and an increase in unemployment levels. During the 51-day Israeli offensive on the Gaza Strip in July and August 2014, Israeli authorities did not allow the entry of any construction materials. As a result, vital and infrastructure projects have been obstructed so far. Israeli forces also continued to impose an almost total ban on the Gaza Strip exports, including agricultural and industrial products, except for light-weighted products such as flowers, strawberries, and spices. However, they lately allowed the exportation of some vegetables such as cucumber and tomatoes, furniture and fish. 3 weeks ago, Israeli forces started to ban the entry of wood under the pretext is it used for constructing tunnels. Israel has continued to close the Beit Hanoun (“Erez”) crossing for the majority of Palestinian citizens from the Gaza Strip. Israel only allows the movement of a limited number of groups, with many hours of waiting in the majority of cases. Israel has continued to adopt a policy aimed at reducing the number of Palestinian patients allowed to move via the Beit Hanoun crossing to receive medical treatment in hospitals in Israel or in the West Bank and East Jerusalem. Israel denied permission to access hospitals via the crossing for new categories of patients from the Gaza Strip. It should be noted that in the past weeks Israeli forces arrested a number of Palestinian traders heading to Israel after they got permits or were requested to meet with the Israeli intelligence service at the crossing. During the reporting period, a patient was arrested at the crossing. · Hebron: Israeli forces have continued to impose severe restrictions on the movement of Palestinian civilians. At approximately 07:00 on Thursday, 07 May 2015, Israeli forces established a checkpoint at the entrance of Beit Kahel village, northwest of Hebron. Around the same time, another checkpoint was established at the entrance of Northern Yata, south of Hebron. Later, both checkpoints were removed, and no arrests were reported. At approximately 07:00 on Friday, 08 May 2015, Israeli forces established a checkpoint at the entrance of Ethna village, west of Hebron. Later, both checkpoints were removed, and no arrests were reported. At approximately 07:30 on Sunday, 10 May 2015, Israeli forces established a checkpoint, at the entrance of al-Mowareq village, west of Dura, southwest of Hebron. At approximately 08:00, another checkpoint was established at Bani Na'im village, west of Hebron. Later, both checkpoints were removed, and no arrests were reported. At approximately 17:00 on Tuesday, 12 May 2015, Israeli forces established a checkpoint at the entrance of Beit 'Awwa village, south of Dura, southwest of Hebron, and closed the iron gate established at the entrance. At approximately 19:30, another checkpoint was established at the entrance of Beit Kahel village, northwest of Hebron. Later, the checkpoint was removed, and no arrests were reported. · Ramallah: Israeli forces have continued to impose severe restrictions on the movement of Palestinian civilians. At approximately 12:00 on Thursday, 07 May 2015, Israeli forces established a checkpoint at the northern entrance of 'Ein Sinia village, north of the city. Later, the checkpoint was removed and no arrests were reported. At approximately 19:00, they re-established at ‘Atara checkpoint at the northern entrance of Bir Zeit, north of the city. They later withdrew, and no arrests were reported. Around the same time, another checkpoint was established at the entrance of 'Ein Sinia village, north of Ramallah. Later, both checkpoints were removed and no arrests were reported. At approximately 10:00 on Friday, 08 May 2015, Israeli forces closed the eastern entrance of al-Nabi Saleh village, northeast of Ramallah. Around the same time, another checkpoint was established under the bridge of Yabrud village, northeast of the city. At approximately 11:00, another checkpoint was established at the entrance of Ni'lin village, west of Ramallah. At approximately 20:00, another checkpoint was established near the intersection of "'Ofrah" settlement, north of Ramallah. Later, all checkpoints were removed, and no arrests were reported. At approximately 10:30 on Saturday, 09 May 2015, Israeli forces established a checkpoint at the entrance of Ras Karkar village, northwest of Ramallah. At approximately 13:30, a similar checkpoint was established at Qebia village, west of Ramallah. At approximately 17:30, another checkpoint was established at the entrance of Beit 'Oar al-Foqa, southwest of Ramallah. At approximately 18:00, another checkpoint was established at the entrance of Deir Abu Mesh'al village, northwest of Ramallah. All checkpoints were later, and no arrests were reported. At approximately 17:00 on Sunday, 10 May 2015, israeli forces stationed at the entrance of al-Nabi Saleh village, northwest of Ramallah, and detained Usamah Belal 'Abdel Salam Tamimi (19) when he was on his way back home. The force officer questioned him on the spot about the pictures of the participants in the weekly peaceful protest organized in the village. He was released half an hour later. At approximately 11:30 on Monday, 11 May 2015, Israeli forces established a checkpoint under the bridge of Yabrud village, northeast of Ramallah. They then detained Haitham Mohammed Khalaf (24) from Selwad village while passing through the checkpoint and took him to "She'ar Benyamin" police station, northeast of Occupied Jerusalem. He was released two hours later, and the checkpoint was removed. · Qalqilya: Israeli forces have continued to impose severe restrictions on the movement of Palestinian civilians. At approximately 14:00 on Friday, 08 May 2015, Israeli forces established a checkpoint at the entrance of 'Azoun Village, southwest of Qalqilya. At approximately 19:00, another checkpoint was established at the eastern entrance of Qalqilya, southeast of the city. Later, both checkpoints were removed, and no arrests were reported. At approximately 19:00 on Saturday, 09 May 2015, Israeli forces established a checkpoint at the entrance of 'Azoun Village, southwest of Qalqilya. Later, the checkpoint was removed, and no arrests were reported. At approximately 08:00 on Sunday, 10 May 2015, Israeli forces established a checkpoint at the entrance of 'Azoun Village, southwest of Qalqilya. At approximately 17:00, another checkpoint was established at the entrance of Amatin Village, southeast of Qalqilya. At approximately 19:30, another checkpoint was established at the entrance of Jeensa'fout, southeast of Qalqilya. Later, all checkpoints were removed, and no arrests were reported. At approximately 08:00 on Monday, 11 May 2015, Israeli forces established a checkpoint at the eastern entrance of Qalqilya, southeast of the city. Later, the checkpoint was removed, and no arrests were reported. · Jenin: Israeli forces have continued to impose severe restrictions on the movement of Palestinian civilians. At approximately 08:30 on Monday, 11 May 2015, Israeli forces established a checkpoint at the intersection of Zaboubah village, northwest of Jenin. At approximately 08:30, another checkpoint was established on the main road between Jenin, Tulkarm and Nablus near al-Shuhadaa' intersection, south of Jenin. At approximately 18:00, another checkpoint was established at the entrance of Ya'bod village, southwest of Jenin. The checkpoint was later removed, and no arrests were reported. · Jericho: Israeli forces have continued to impose severe restrictions on the movement of Palestinian civilians. At approximately 10:30 on Friday, 08 May 2015, Israeli forces established a checkpoint near the entrance of Fasayel village, north of the city. At approximately 20:20, another checkpoint was established at the southern entrance of Jericho. Later, both checkpoints were removed, and no arrests were reported. At approximately 10:30 on Monday, 11 May 2015, Israeli forces established a checkpoint near the entrance of Fasayel village, north of the city. At approximately 20:20, another checkpoint was established at the southern entrance of Jericho. Later, both checkpoints were removed, and no arrests were reported. · Tulkarem: Israeli forces have continued to impose severe restrictions on the movement of Palestinian civilians. At approximately 09:00 on Thursday, 07 May 2015, Israeli forces established a checkpoint at the entrance of Far'on village, south of Tulkarm. The checkpoint was later removed, and no arrests were reported. At approximately 12:30, Israeli forces stationed at ‘Annab military checkpoint which is established on the road between Tulkarm and Nablus, east of the city, tightened their restrictions against civilians and obstructed their movement. Later that day, the tightening ended and no arrests were reported. At approximately 19:00 on Saturday, 09 May 2015, Israeli forces established a checkpoint at the entrance of Shofah village, southeast of Tulkarm. The checkpoint was later removed, and no arrests were reported. At approximately 14:30 on Sunday, 10 May 2015, Israeli forces stationed at ‘Annab military checkpoint which is established on the road between Tulkarm and Nablus, east of the city, tightened their restrictions against civilians and obstructed their movement. Later that day, the tightening ended and no arrests were reported. The tightening recurred at approximately 19:30 on the same checkpoint, but no arrests were reported. At approximately 09:00 on Monday, 11 May 2015, Israeli forces established a checkpoint at the entrance of Far'on village, south of Tulkarm. At approximately 10:00, another checkpoint was established at the entrance of Shofah village, southeast of Tulkarm. Both checkpoints were later removed, and no arrests were reported. · At approximately 10:30 on Friday, 08 May 2015, Israeli forces stationed at gate No. 914 of the annexation wall near Falamiyah village, east of Qalqilya, arrested Mokhles Rakez 'Aqel Tobah (17) from Kafr Jammal, northeast of Qalqilya. He was later taken to unknown destination. · On Sunday afternoon, 10 May 2015, Israeli forces stationed at the gate of the annexation wall established at the entrance of Eastern Barta'ah village, which is isolated from its surroundings due to the annexation wall, west of Jenin, arrested Fayez Mohammed Fayez Qobaha (23) from Western Tourah village, west of Jenin, while passing through the checkpoint. He was then taken to an unknown destination. · At approximately 10:00 on Tuesday, 12 May 2015, Israeli forces stationed at the electronic gate leading to al-Ibrahimi Mosque in the center of the old city in the center of Hebron arrested 'emad Sa'di Soliman al-Tarwah (22) claiming that he had a knife. They later took him to an unknown destination. · At approximately 06:00 on Thursday, 07 May 2015, Israeli forces accompanied by 2 vehicles of the Israeli Civil Administration and 2 bulldozers moved into the south of al-Ramadeen village, southwest of Hebron. They stationed between Om Sedrah and al-Masamrah areas and damaged the electricity network between the 2 areas under the pretext it was in area (C). As a result, 30 electricity poles were damaged and the abovementioned areas had a power outage. When Palestinians tried to stop Israeli forces, the soldiers fired sound bombs and tear gas canisters in response. As a result, a number of Palestinians suffered tear gas inhalation and Moheeb Hassan Zagharnah (17) was arrested. It should be noted that the 2 residential compounds in Om al-Sedrah and al-Masamrah are 30 meters away from the annexation wall and are inhabited by 250 persons. The electricity network that was damaged was established there in 2008. · At approximately 16:00, on Sunday, 10 May 2015, Israeli forces demolished the tomb of Shaikh Kamel in Beit Dajan village, east of Nablus. They also seized all the stones by which the tomb was built. · At approximately 10:00 on Tuesday, 12 May 2015, Israeli forces accompanied by Civil Administration vehicles moved into Sousya village, south of Yatta, south of Hebron. They handed Khalil Afani al-Nawaj'a a summons to halt construction works in 2 residential tents under the pretext they were not licensed. It should be noted that on 04 May 2015, Israeli authorities refused through the Israeli Supreme Court to issue a temporary order to obstruct the decision that was issued to demolish all the houses of the village, in which about 300 persons live, as the court' decision allows Israeli forces to implement the order anytime. In the meantime, settlers seized control over 3,000 dunums of the village lands and established "Sousya" settlement, to the east of the village. · At approximately 07:30 on Friday, 08 May 2015, 3 settlers from "Sousya" settlement, south of Yatta, south of Hebron, cut off branches of 3 old olive trees belonging to Mohammed Mosallam al-Nawaj'a in Kherbet Sousya. Settlers' attacks increased after the Israeli court issued a decision allowing Israeli forces and Civil Administration to evacuate Kherbet Sousya from its residents under the pretext there is no infrastructure in the Kherbe. · At approximately 19:00 on Saturday, 09 May 2015, a group of settlers attacked a number of civilian houses in Tal al-Rumaida neighborhood, in the center of Hebron. They stopped the houses residents and denied them access to their houses. The settlers threw stones at a house belonging to Yasser Abu Markhiya and attempted to raid the house and attack his children in front of the Israeli soldiers who deployed in the neighborhood. The residents are subjected to physical search and observed by surveillance cameras fixed on the walls to protect settlers from "Ramat Shai" settlement, in the center of the neighborhood. Moreover, there are military checkpoints established at the eastern and western entrances of neighborhood. · On Tuesday early morning, 12 May 2015, Israeli forces accompanied by a bulldozer moved into agricultural lands that are rented to cut off construction stones, east of Silwad village, northeast of Ramallah. The bulldozer demolished a wall and tin plates belonging to Abdullah Tawfiq Ahmed Hamed (63) for no apparent reason. It should be noted that Israeli forces demolished a barrack belonging to the aforementioned person on 16 March 2015 under the pretext of non-licensing. The barrack was used to store work equipment and tools. At least 95% of Palestinians arrested by the Israeli occupation forces have been subjected to psycho-physical torture both throughout the interrogation and post-interrogation phases, a Palestinian human rights activist reported Monday. 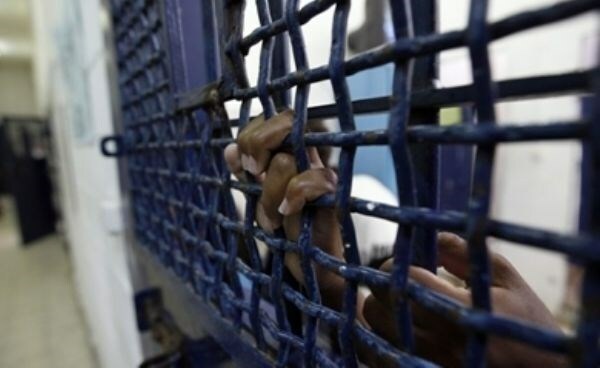 Media advisor at the Prisoners and Ex-Prisoners Committee, Hasan Abd Rabo, said in a press statement the Israeli occupation spares no single effort to castigate the Palestinian detainees and use them as bargaining chips in political races. The activist spoke out against Israel’s pre-mediated medical negligence against the detainees, citing the deliberate contamination of infectious germs into the bodies of sick prisoners as a case in point. “Dozens of detainees are subjected to dire circumstances and need urgent medical therapy for the Israeli wardens only provide them with provisional painkillers,” he said. Abd Rabo also raised alarm bells over the mistreatment and abuse undergone by Palestinian female detainees and children at Israeli lock-ups, where neither gender nor age seem to have made a difference. The activist called for the need to join forces with all human rights organizations, both nationwide and overseas, to speak up for the prisoners’ rights and work on assuaging the agonies inflicted by Israeli wardens on Palestinians. Israeli Occupation Authorities (IOA) issued 30,000 demolition orders against Palestinian-owned facilities since Oslo accords in 1993, an Israeli rights group said in Monday. In a new report, Planners for Planning Rights (Bimkom) affirmed that since seizing the West Bank in 1967, Israel has held full control over all planning matters for both Palestinians and Jewish settlers in area C that covers over 60 percent of the territory. The Israeli rights group said that although settlers can easily secure building permits, Palestinians found themselves forced to build "illegally", where hundreds of unauthorized structures have been yearly demolished. Over 60 percent, around 360,000 hectares, of the West Bank is classified as Area C, where Israel has full control over security and also civilian affairs which are managed by the Civil Administration, a unit of the Israeli war ministry. UN figures show there are an estimated 298,000 Palestinians living in Area C, grouped into 532 residential areas, while there are 341,000 Israelis living in 135 settlements and 100 unauthorized outposts. "Only one percent of Area C is designated for Palestinian development, compared to 70 percent designated for settlements expansion," the UN says. Palestinian construction in the other 29 percent of Area C is subject to severe Israeli restrictions. 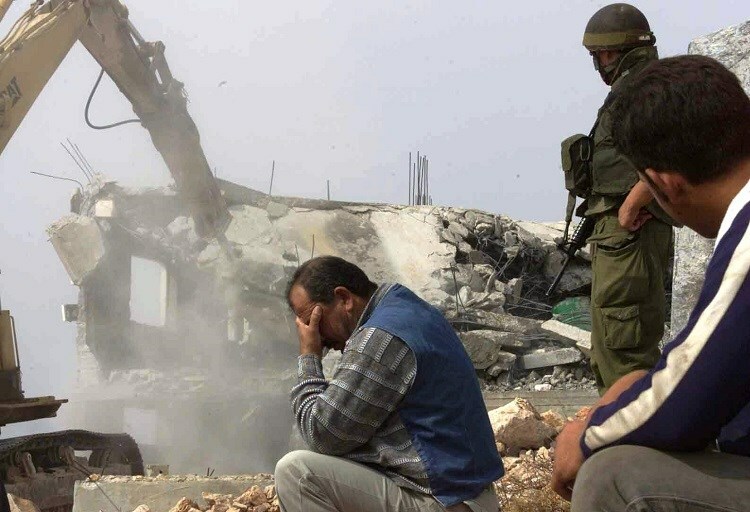 "Since Oslo Accords, Israel has issued more than 14,600 demolition orders, of which 2,925 structures have actually been demolished," Bimkom reported. Bimkom architect Alon Cohen Lifschitz estimates there are an average of two structures per order, meaning that over the past decade, Israel has issued demolition notices for nearly 30,000 Palestinian-owned facilities. In 2014, 911 demolition orders were issued against Palestinian homes, barns, fence, cemeteries, and solar panels under the pretext of being built without permits. There are currently more than 9,100 outstanding demolition orders which can be implemented at any time, Bimkom pointed out. Since 1996, Israel has granted only a few hundred building permits for Palestinian structures. According to Amnesty International, there were 76 building permits issued to Palestinians between 1996 and 1999. And from 2000-2014, only 206 building permits were issued, Bimkom says. In 2014, Israel granted a single building permit. "In Area C, a two-tier planning system operates based on ethnic-national background: a civil and representative planning system for Jewish settlers and a military system without representation for Palestinians," Israeli NGO Rabbis for Human Rights said. In planning for Palestinian villages, the objectives are to limit land use and encourage dense construction, whereas in the settlements, the trend is often the opposite –- to include as much area as possible, producing particularly low density levels, it explained. 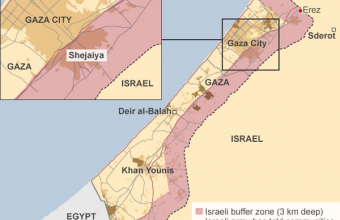 Following disengagement from the Gaza Strip in September 2005, Israel unilaterally and illegally established a so-called "buffer zone", an area prohibited to Palestinians along the land and sea borders of the Gaza Strip. The precise area designated by Israel as a "buffer zone" is not clear and this Israeli policy is typically enforced with live fire. The establishment of the 'buffer zone' is illegal under both Israeli and international law. Preventing Palestinians from accessing their lands and fishing areas violates numerous provisions of international human rights law, including the right to work, the right to an adequate standard of living, and the right to the highest attainable standard of health. Enforcing the "buffer zone" through the use of live fire often results in, inter alia, the direct targeting of civilians and/or indiscriminate attacks, both of which constitute war crimes. Then, on 21 March 2013, the Israeli forces' spokesperson announced re-reducing the fishing area allowed for Palestinian fishermen from 6 nautical miles to 3 nautical miles. However, on 21 May 2013, Israeli authorities decided to allow fishermen to sail up to 6 nautical miles. Following the latest Israeli offensive on the Gaza Strip (08 July - 26 August 2014), a ceasefire agreement between Israel and Palestinian armed groups was brokered by the Egyptian government, which allowed fishermen to sail up to 6 nautical miles. However, the Israeli naval forces have not allowed fishermen to sail up to this limit as all Israeli attacks have taken place within the 6-nautical- mile fishing area. · Approximately 27,000 dunums, 35% of the Gaza Strip's agricultural land, can only be accessed under high personal risk, as Israeli attacks may result in injury or death of civilians. (2008-2009), the majority of Palestinian families living in the border areas abandoned their land and homes. · Approximately 65,000 persons, including individuals who work in the fishing industry and their dependents, are affected by the "buffer zone" restrictions at sea. Thirteen Palestinians, including two children and five journalists, were injured by Israeli forces during various clashes across the West Bank and occupied Jerusalem in the context of demonstrations marking the World Press Freedom Day, OCHA weekly report revealed. The weekly report that covers the period between 8 April and 4 May 2015 documented at least 25 incidents involving Israeli forces’ opening fire at Palestinian civilians in the Access Restricted Areas (ARA) at land and sea in the Gaza Strip. The attacks resulted in no casualties. During the reported period, 320 Palestinians, half of them children, from six small herding communities in the northern Jordan Valley, were temporarily displaced for several hours during two days in the context of a large Israeli military training exercise. The Israeli authorities demolished four Palestinian structures in two communities in Area C for lack of Israeli-issued building permits, affecting at least two families. This brings the total number of structures demolished on these grounds in Area C since the beginning of 2015 to 189, compared to 216 in the equivalent period of 2014, the report stated. The UN report said that Israeli forces conducted 95 search and arrest operations and arrested 106 Palestinians in the West Bank; during which 106 arrests were reported while the highest number of arrests (41) was recorded in occupied Jerusalem. Also, nine Palestinians were arrested by Israeli forces in the Gaza Strip while attempting to cross into Israel without a permit. Four Israeli settler attacks resulting in Palestinian injuries or property damage were reported, including two physical assault and property damage incidents, the report documented.